1 down 800,000 to go! But wasn't the hanger textured as well? Yes it is textured but it has only a lightmap with baked ambient occlusion. This new building has a diffuse texture with specular map in alpha channel. hrm.. Have to say I am not really impressed. Even with the "diffuse texture with specular map in alpha channel." Did you model it from scratch? Wow! That looks incredible, especially the first shot where you can see the building from a distance. How far away are you in that shot? Can you show what the building looks like from even farther away? Does it start as a single pixel and then grow larger as you get closer, Or does it just "pop up" into view at a certain distance? And also if it does pop up can you make that distance configurable so that users can tweak based on the power of their cpu/gpu? 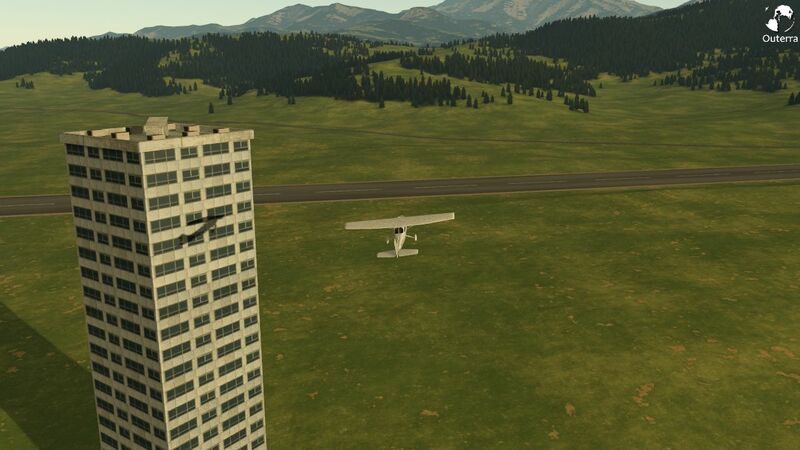 It's important for flight simulation that when approaching a large city the big buildings are visible from a very far distance (single pixel), in FSX they "pop up" at 10 NM which really spoils the immersion! Microsoft should licence this engine from you if they ever make FS11. Keep up the good work you guys are amazing! Actually that is a good point. Can we get an HD vid showing the transitions? are their transitions yet for things like buildings? Or do you need to model a "crappy" building for long range? Generally, things will start showing up when they are 1 pixel big. The engine computes on-screen size of things and if the objects cross the threshold they will appear. Although, at that distance aerial fog plays a significant role so they might not be even visible. The computed size is multiplied by a quality coefficient, so let's say for Q=0.5 objects will start to appear when they are roughly 2px big. Q can be set to greater than 1 too, but as the coefficient applies to the terrain as well, it needs adequately more GPU memory as well. Note that there are currently some temporary internal limitations where the rule doesn't apply yet, for example runways start showing up from a fixed terrain level. But that will be fixed. Currently we are using Q=0.5 I think, but things are changing constantly as we tune it and depend on the hardware. are their transitions yet for things like buildings? Or do you need to model a "crappy" building for long range? LOD for objects isn't there yet, but there will be an option to provide LOD levels with models or to have engine generating the detail levels automatically (may not be optimal). But of course a reduction in level of detail has to be used if we want to render large cities. Excellent! At least they don't suddenly pop-up at 10nm like in FSX which is pathetic. Aerial fog? Is this a technique you use to obscure objects/terrain off in the far distant so you don't have to render them? In that first shot it seems the fog is still letting the terrain (and presumably objects if bigger than 1px) show though even at about 40nm? 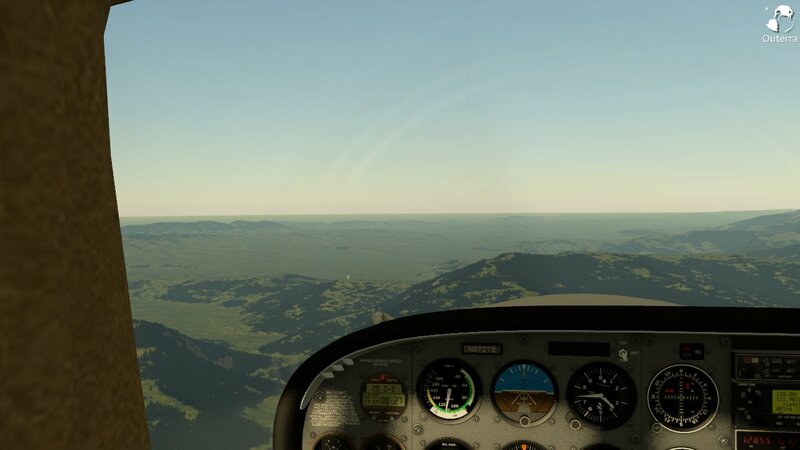 I should mention that in FSX terrain is visible at more than 150nm (though objects are not visible past 10nm). I think I saw in one of your videos the terrain being visible at very great distances as you zoomed out to space. XPlane limits terrain and object visibility to about 25nm before everything is fogged out, that is a joke for high level flight! Also, for performance users with less capable machines might have to slide the quality multiplier down, say to .25 and this would cull a lot more objects, but some objects are more important to see than others! For example, in a flight simulator I might like to have airports (runways and buildings) show at a quality of 1.00 but other less important objects (eg houses) show at a quality of .25. Is it possible for your engine to accommodate this? I guess the engine needs to know what "class" of scenery the object belongs too and then apply quality factors based on the class... this gives users the ultimate tweak-ability to suit their hardware and personal FPS tolerance! Please consider "tweak-ability" when designing your engine. You have no idea how much FSX/FS9 users tweak various settings in order to balance smooth FPS against nice visuals, especially when running complex aircraft which are simulating/rendering complex systems (eg PMDG 747, MD11 or LDS 767). 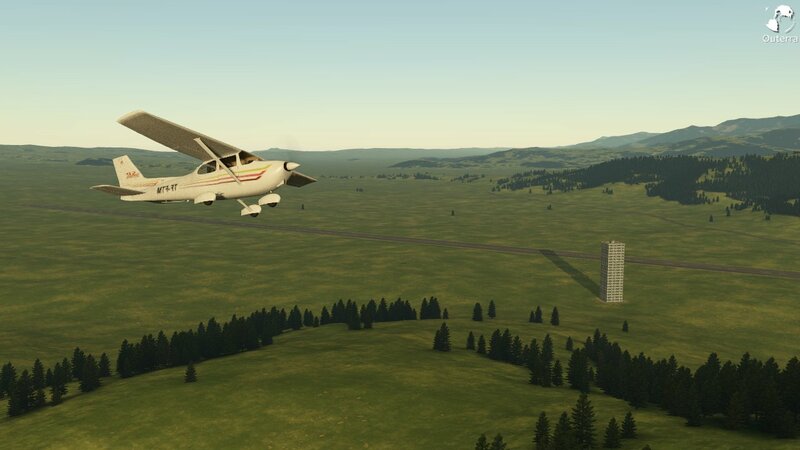 I think this would be possible, although for example roads & runways are tied to terrain so there would have to be one slider for terrain quality that applies to roads and runways too. Getting a better Q specifically for runways can be achieved here by selectively boosting Q of terrain tiles containing runways. Q for objects can be separate, and there could be classes of objects having their own Q for prioritizing. I've read several threads where FS users talked endlessly about tweaking the parameters, and I have overall bad feelings about the system that allows to break stuff by allowing to twiddle with too many knobs. That kind of action is common in layered-type rendering where you can switch off this and adjust that, but our system is much more organic in order to get more natural results, so that level of tinkering is neither possible nor something we would want to have. That doesn't mean it won't be tweakable, but it will be much more compact for certain. And different. I suppose strong light sources like airport beacons would be visible long before the actual airport buildings due to their strong intensity. Night lighting is something where FSX is very poor. In particular airports are very dimly lit and the actual lighting effect itself tends to popup only at close distance. I'm guessing that in Outerra airport lighting at night would be visible from far distances and appear quite bright. Great Idea and don't shift from that decision. or you will regret it. The time wasted on M$FS forums by people who actually don't fly but spend all their time Slewing and fiddling with settings is pretty high.